Classically influenced World Music in unique and captivating arrangements, ViBO Simfani performs actively for Festivals, Weddings, Corporate Events and Schools. With the sounds of violin, cello, guitar, percussion and vocals, ViBO Simfani brings new lives to songs from different cultures. 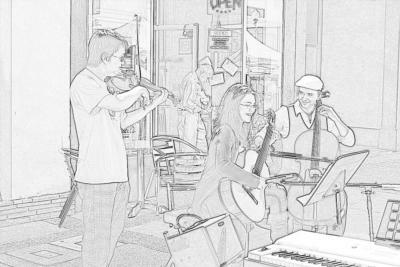 Our repertoire consists of a modern eclectic mix of Brazilian choro, classical, latin jazz, folk and pop. 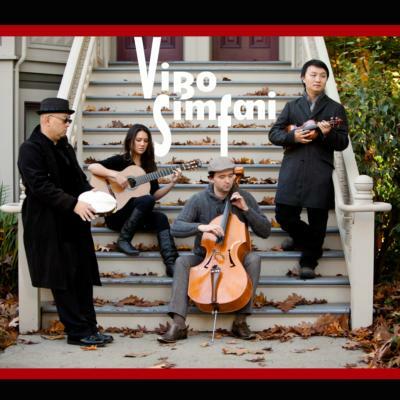 ViBO Simfani was founded in early 2010 by the violinist Victor Lin and the cellist Pawel Walerowski, with a simple purpose of playing Brazilian choro music for fun. They invited Theresa Calpotura and Mike Masuda to join the group and performed as a quartet for the first time, at the ViBO Family Music Camp in Petaluma in the summer of 2010. Even since then, the group keeps expanding their repertoire to be more culturally diverse. ViBO Simfani spent a big part of 2011 recording their self-titled debut album, which was released in Feb. 2012. The group then performed a series of concerts in San Francisco, Walnut Creek, Martinez, San Bruno, Berkeley and Oakland. Besides covering international tunes, ViBO Simfani delivers more and more original music. Please note Vibo Simfani will also travel to Millbrae, Pacifica, San Francisco, South San Francisco, Brisbane, Burlingame, Daly City, Belmont, Montara, San Mateo, El Granada, Moss Beach, Half Moon Bay, Alameda, Redwood City, San Carlos, Oakland, Piedmont, San Leandro, Emeryville.